A couple of weekends ago, London and I went camping and stargazing at Afton Canyon, a nice dark spot about 40 miles east of Barstow. On the way home, we took the exit off I-15 at Ghost Town Road, initially because we wanted to visit the old Calico Ghost Town. 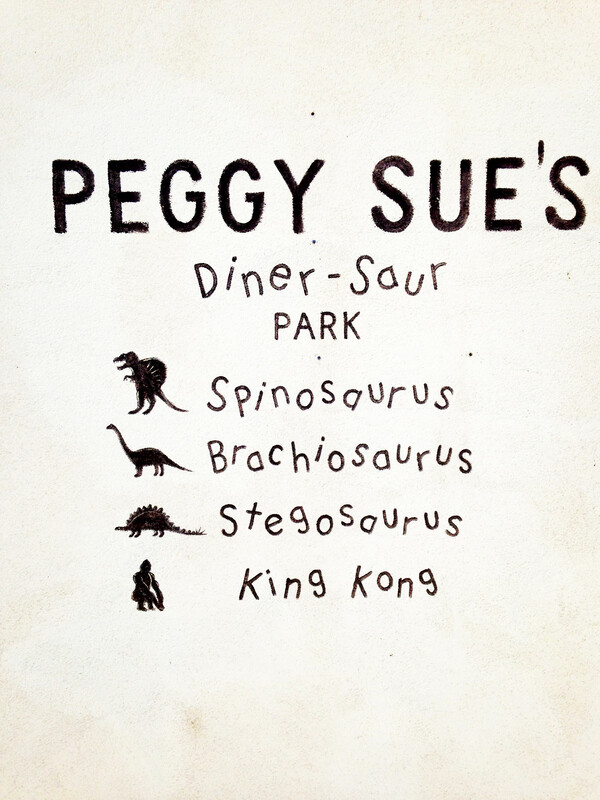 But then we saw big metal dinosaurs south of the highway, and that’s how we came to Peggy Sue’s Diner and in particular the Diner-saur Park. The Diner-saur Park is out behind the diner and admission is free. There are pools with red-eared sliders, paved walkways, grass, trees, a small gift shop, and dinosaurs. 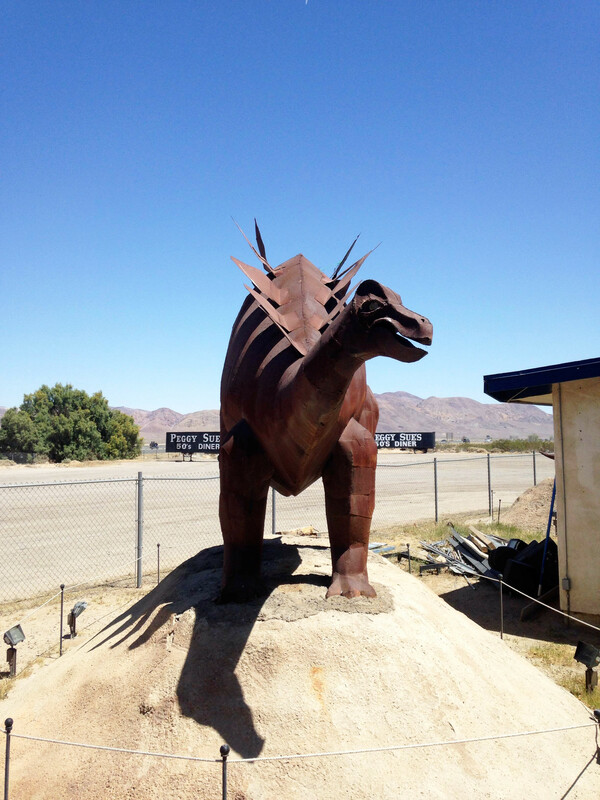 Here’s a Spinosaurus – curiously popular in the Mojave Desert, those spinosaurs. Ornithischians are represented by two stegosaurs, this big metal one and a smaller concrete one under a tree. 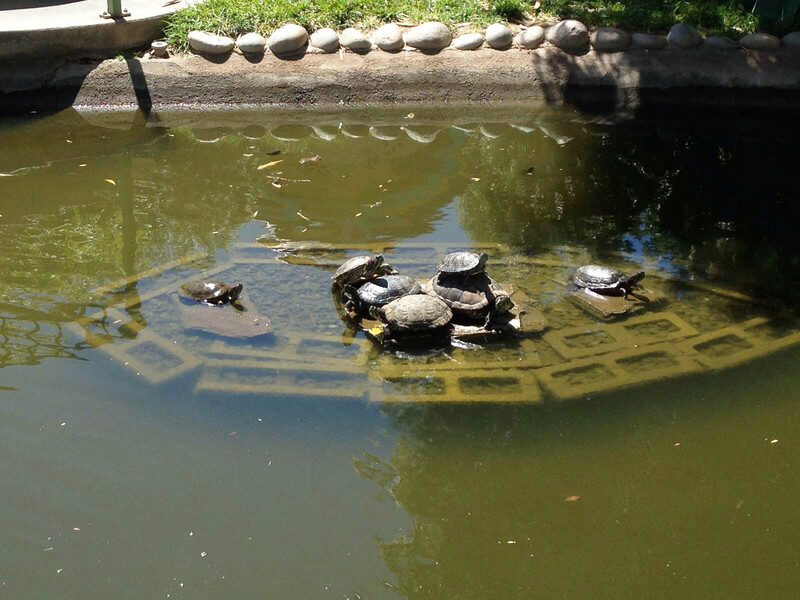 The turtles are entertaining. They paddle around placidly and crawl out to bask on the banks of the pools, and on little islands in the centers. The gift shop is tiny and the selection of paleo paraphernalia is not going to blow away any hard-core dinophiles. But it is not without its charm. 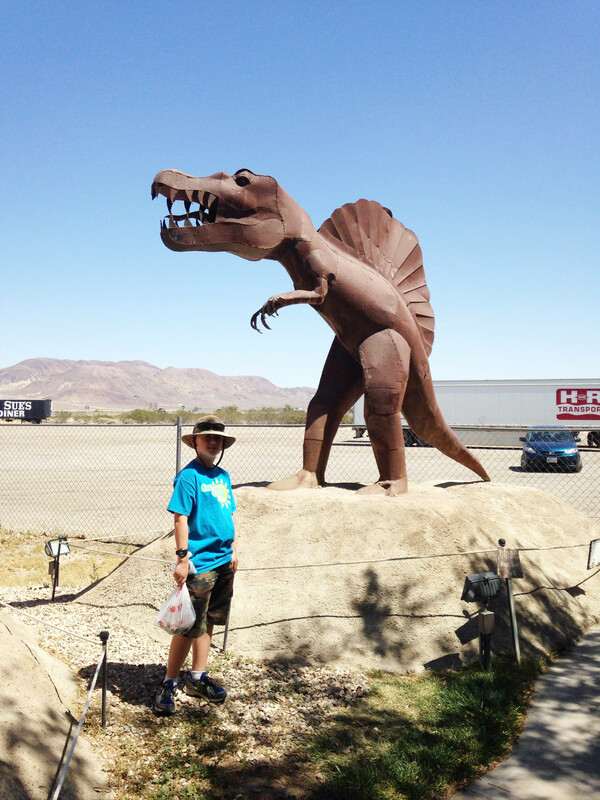 And, hey, when you find a dinosaur gift shop in the middle of nowhere, you don’t quibble about size. London got some little plastic turtles and I got some cheap and horribly inaccurate plastic dinosaur skeletons to make a NecroDinoMechaLaser Squad for our Dinosaur Island D&D campaign. If I had noticed it sooner, I would have maneuvered for a better, more comparable shot. My first thought when I saw that skinny neck was: mamenchisaur. But, really, who can tell what goes on in the minds of roadside dinosaur engineers? 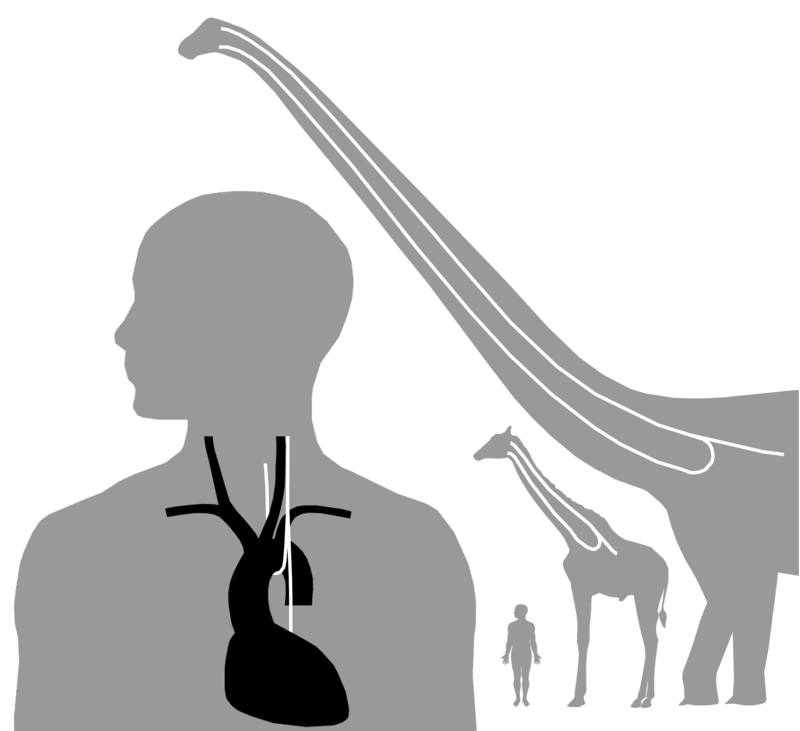 Hmm… to me, that sauropod looks like the Dreadnoughtus schrani skeletal in Lacovara et. al.’s paper. In that they’re both sauropods, maybe. But this one is not nearly fat enough. Especially the neck. Go look again at Dreadnoughtus. Somehow they got the fleshy envelope to be 2-3x the height of the actual vertebrae. Love the dinosaurs! They really are true works of art. Did you take any pictures of the stargazing? I’d be really interested to see them! Related to this topic, I have created a review for an ebook that takes its reader on a tour through the sky. Might be something you’re interested in on your next stargazing trips. I put the review link in my website section. Hi Giles, thanks for the kind words. I didn’t take any photos of astronomical objects, but I did get some photos of the campsite and the telescopes we were using. The link is in the first sentence of the post, and here it is again. I’ll have a look at that ebook. I’m always up for new night sky tours. « What are we going to call PLOS ONE-style peer-review?